Back in Print at Last: Two Consecutive Novels in the Top-Selling Liaden Universe(R) Space Adventure Series: Plan B and I Dare. The Liaden Universe(R) series has enthralled thousands of readers, and now two of its most exciting space adventure novels are combined in one popularly-priced Omni-trade volume. But Val Con's cousin, Shan yos'Galan, can't wait for help that may never arrive. With enemy agents closing in, he invokes Plan B--setting in motion a series of events that will have dire consequences, not only for him and his life-mate, Priscilla Mendoza, but all of Liad . . . But the DOI is attacking Clan Korval in a more subtle fashion. Pat Rin yos'Phelium--Val's ne'er-do-well, nearly identical cousin, gambler and shooter--is offered control of the clan. The DOI believes they can manipulate him into serving their agenda. Sharon Lee and Steve Miller live in the rolling hills of Central Maine with two insistent muses in the form of cats and a large cast of characters. 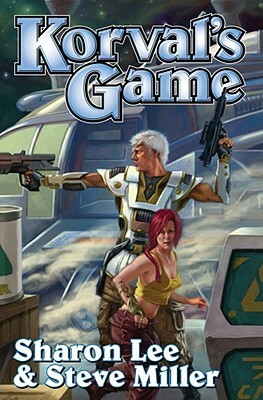 The husband-and-wife team's collaborative work in science fiction and fantasy include twelve novels and numerous short stories in their award-winning Liaden Universe(R). In addition to their collaborative work, Steve has seen short stories, nonfiction, and reviews published under his name, while Sharon has seen published short stories, newspaper pieces, and two mystery novels. Steve was the founding curator of the University of Maryland's Kuhn Library Science Fiction Research Collection and a former Nebula juror. For five years, Sharon served the Science Fiction and Fantasy Writers of America, consecutively as Executive Director, Vice President and President. Sharon's interests include music, seashores and pine cones. Steve also enjoys music, plays tournament chess, and collects cat whiskers.